COLOMBO, Jun 14 2013 (IPS) - For the first time since Sri Lanka’s 30-year-long civil conflict drew to a bloody finish in May 2009, casting an eerie hush over the Northern Province that had grown accustomed to the sounds of war, there is a buzz in the air generated by the prospect of provincial elections that hold the promise of radical change. Though it is yet to be announced formally, political circles in the capital, Colombo, are fixed on the prospect of an election in September. The most pressing question is whether or not the government of President Mahinda Rajapakse will allow the devolution of power from the centre and the creation of the country’s first-ever Northern Provincial Council (NPC). It was exactly this question, and politicians’ inability to resolve it, that tore this South Asian nation of 20 million people apart for three long decades as the island’s two peoples – the Sinhalese and the Tamils – came to blows over national sovereignty. Based primarily in the northern and eastern provinces, Tamils in Sri Lanka have long demanded some degree of autonomy and independence from the rest of the island, citing economic exclusion and discrimination by leaders who favour the interests of the majority. An unbroken line of Sinhala-led governments has ignored the demand, insisting on maintaining a single, unified state. In 1983, demands for political autonomy coalesced around a rebel group, the Liberation Tigers of Tamil Eelam, which launched a campaign of armed guerilla warfare against the government. The group sought to create a separate state for Tamils in the northern and eastern regions of the country in an area covering 7,390 square miles. In 1987, in an effort to reconcile what was then a four-year-long battle that showed no signs of abating, India brokered a peace accord between the government and the Tigers that provided for the devolution of power to Sri Lanka’s nine provinces and the creation of independent provincial councils endowed with the power to oversee industries like agriculture, manage the police force and collect funds through provincial taxes. This provision, the 13th amendment to Sri Lanka’s 1978 constitution, was the country’s first attempt at decentralisation since it gained independence from British rule in 1948. Despite initial signs of success, the process unraveled within two years when the then Provincial Government declared an independent Eelam, prompting Colombo to reinstate direct rule over the province. In the next few decades, the region was torn asunder in the war between the LTTE and government forces. Power over the north and its 1.1 million people remained in Colombo’s hands – until now, perhaps. While there is much excitement over the prospect of an NPC, political parties know that elections will not bring change overnight. At most, according to Rajavarothayam Sampanthan – leader of the Tamil National Alliance (TNA), the largest Tamil party in Sri Lanka and the one most likely to win the NPC – the elections signal a new beginning. “Elections could provide political parties with the opportunity to have their policies democratically endorsed,” Sampanthan told IPS. How effective that endorsement will be depends on how much power the central government is willing to devolve. A lot also rests on the provincial governor, a presidential appointee endowed by the constitution with tremendous powers that can override decisions made by the elected provincial council. Sampanthan admitted that the chances of power being devolved to an opposition-run council are limited. Without the ability to at least control job creation and industrial development, two areas currently controlled by the government in Colombo, the success of a TNA-controlled NPC will be limited, he said. However, political commentator Jehan Perera, who heads the National Peace Council, sees another role for the NPC: as a regional forum that can represent the province both nationally and internationally. “The body can better articulate the interests of the people,” Perera told IPS, referring to issues like unemployment, transport and water management that only get addressed in relation to international complaints. The eight functioning councils are currently all under the control of the government and unable to give voice to their constituencies. An opposition-held council, on the other hand, can be more aggressive should it feel the government is putting curbs on its powers and “has the chance to be a very vibrant forum,” Perera said. People in the Northern Province, however, are not so sure. Jegan Murthy, a 27-year-old shopkeeper in the northern town of Jaffna, the cultural and political nerve centre of the Tamils in Sri Lanka, said that if the war-battered community is to regain any hope, the NPC has to be more than just a platform for discussion and protest. 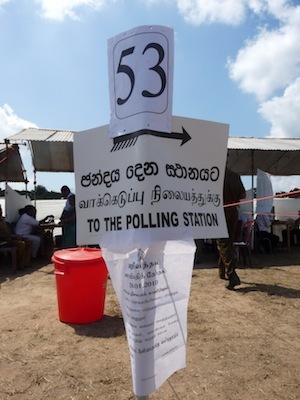 In the battle-scarred town of Kilinochchi, 330 kilometres north of Colombo, people mention the election only in passing, like something they have to endure, akin to the skin-searing heat that bears down on them all year long. “Elections? What elections?” 22-year-old Shanthini Kumar asked when IPS sought her opinion on the subject. She is grateful to have made it alive through the six months of the Sri Lankan army’s final surge against the LTTE, between November 2008 and May 2009, a battle which saw heavy civilian casualties and exposed the government’s human rights record to worldwide scrutiny. Over 460,000 persons have returned to the Northern Province since the end of the war, but found hard times waiting for them. “We need houses, jobs and transport; we need money in our hands. Then we can think of elections,” Kumar said. Jobs are hard to come by and donor assistance is largely drying up: the latest U.N.-Sri Lanka joint funding appeal for 147 million dollars in 2012 fell short by 73 percent. The U.N. estimates that there is a need for over 100,000 houses. Officials from the Sri Lanka Red Cross Society, which is constructing the largest number of houses in the former war zone, says over 170,000 homes are needed, but according to U.N. data existing funds will provide no more than 55,000 humble dwellings.